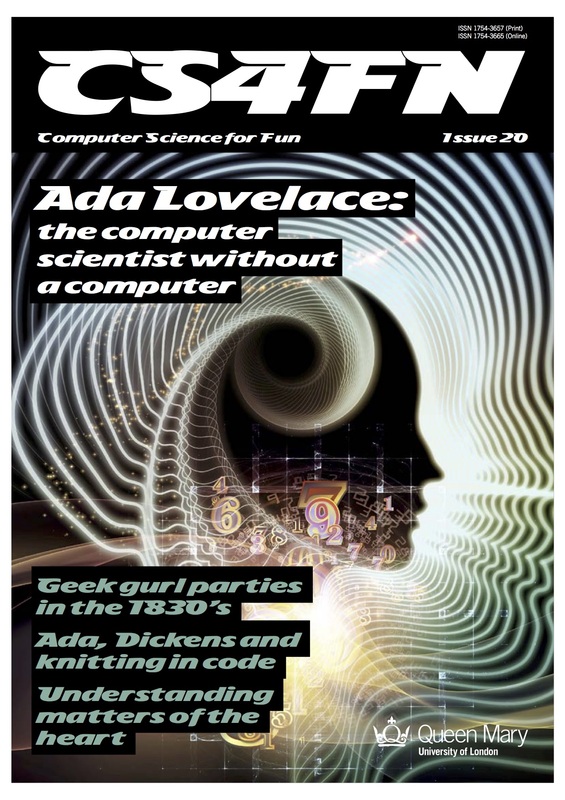 2015 is the 200th anniversary of Ada Lovelace’s birth. Famous as 'the first programmer' her vision of computer science was far wider. To celebrate, issue 20 of cs4fn magazine explores her life, her ideas and where modern research has taken some of those ideas. Women’s research is also still at the forefront of interdisciplinary computer science. We will look at what other Victorian Computer Science was around at the time and also see how her work linked to the very modern idea of computational thinking. Issue 20 of the cs4fn magazine directs you to the web site for more on various articles. Find all the articles as well as linked extras below. cs4fn issue 20 is edited by Paul Curzon, Jane Waite, and Peter McOwan of Queen Mary University of London and Ursula Martin of the University of Oxford. Autumn 2015. EPSRC supported this issue through research grant (EP/K040251/2). The issue was also supported by the Mayor of London and Department for Education. cs4fn is a partner on the BBC’s Make It Digital Programme. cs4fn is generously supported by Google.